Now available for the first time ever as a Blu-ray collection! Get ready to raise some shell. For the first time ever in one complete collection and for the first time ever on Blu-ray come the original live action Teenage Mutant Ninja Turtles 1, 11 and 111. Cowabunga! We have teamed together with the distributors to promote their competition to give three lucky readers the chance to win the complete collection on DVD. 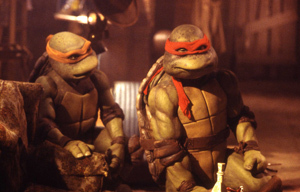 Teenage Mutant Ninja Turtles are destined to be huge again with the impending 2014 release of Michael Bay’s 125 million dollar live action reboot. 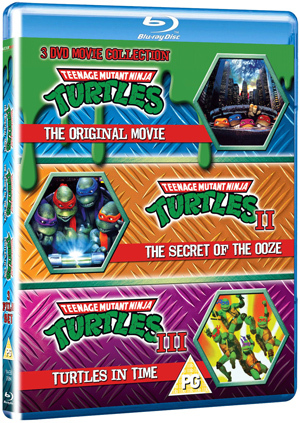 So join Leonardo, Michelangelo, Donatello and Raphael and their loyal sensei Splinter as they battle evil enemies in the original three rip-roaring, action packed adventures which will be released as a bumper three-disc set for the first time on Blu-ray along with a DVD version on 28th October, 2013 thanks to Mediumrare Entertainment. We have 3 lovely copies of the Blu-ray collection to give away!! Who is the Turtles arch enemy?